​Donald Tusk gave Theresa May ten days (with less than a week remaining) to offer him much more money and also give him a solution that he likes to the Irish border problem. We should be relaxed about this and either give what is legally due the EU or nothing and sort it out after Brexit. This dictatorial deadline that conflates both the Irish border problem with their demand for huge sums of money before trade is discussed is contemptable. The border arrangements depend on trading terms so trade should be discussed before the border. Tusk's attempts to fine us for leaving should be ignored. No matter how much money we give the EU it will never satisfy all EU states – who still have to ratify any agreement that Tusk makes with the British Government. Let's bear in mind that the Poles, who have been eating our lunch for years, demanded a settlement of €100 billion. They're simply waiting for the opportunity to veto whatever settlement is made and will take the negotiated settlement as a starting point for getting more money. The EU has never been about security and freedom from warfare as claimed. It's true that immediately after WWII the shock of that war sharpened minds and caused a search for a basis for cooperation in avoiding future wars. Basing future peace and security on an economic system was fundamentally flawed because economics is only about money. Money is now the problem, not only of the current negotiations but of the EU itself. The EU's money is the Euro and the one useful thing that Gordon Brown did was keep the UK out of that deadly trap. The Euro together with the debt that was foisted onto the southern European countries by the bankers is strangling them. The euro prevents them devaluing their currencies to adjust export competitiveness with the stronger northern countries such as Germany. Then the bankers make them sell state assets to pay their debt. EU economic theory is that compensation for this disadvantage is provided by the policy of 'free movement' that shifts population from countries suffering enemployment to the countries that have caused the unemployment. Free movement has never been openly discussed as the 'rebalancing' factor to the Euro because it looks like what it is – a sop to banker and burocratic consciences. In terms of human welfare it's a disaster. So who now owns the debt that brought Greece to its knees, stripped its assets and still keeps the country in poverty? The European Central Bank (ECB) purchased a lot from the bankers to keep the risk of Greek default off the banks' balance sheets, so passing the risk to EU taxpayers. Doubtless, they want to factor some of this debt into the Brexit payoff. In the meantime, the ECB has made €7.2 billion profit in interest payments from the Greek debt crisis. Germany has collected €1.1 billion profit from its loans to the Greeks. That's economics and it's legal – but not right and just and everyone knows it. problems between EU countries. The attempt to base the EU on economics threw the continent back to an era when it was normal for countries to take what they could get from their neighbours by whatever means they could. The ECB is doing it to southern Europe and Donald Tusk is trying to do it to us now. European culture is expressed politically by democratic vote. John Major calls the Brexit referendum outcome the 'tyrrany of the majority', a terms from nineteenth century political theory that refers to forcing ethnic or religious minorities, for example, to conform to the majority population's views. Someone should tell him that democracy actually depends on finding out and accepting the wishes of the majority. Sir John was never the brightest LED on the Christmas tree and one wonders what he did to get onto the board of one of George Bush's companies and what he does, now there. When Sir John shows such embarrassing misunderstanding to scrape opposition to Brexit and Sir Richard Branson, Man of the People, finances an anti-Brexit, second referendum campaign, one knows exactly who benefits from the EU. It's not you or me. How is it that Donald Tusk has given us no thanks for the £110 billion nett contributions that I estimate we've paid since 1973 when we joined the EU. That figure makes no allowance for inflation so it's probably worth £200 billion. This is doled out to ingrates like the Poles as 'EU' funds. Well it's not. A big chunk is UK money and if in future the Poles want to go on spending other people's money as they've become accustomed to doing, they can get loans from the ECB like the Greeks. We went into the Common Market in good faith with good Christian values to contribute help to a few of our developing neighbours and find that we've been financing the lavish lifestyles and pensions of has-been EU politicians and their useless bureacracy that wants to bleed our economy. More than that, there are now fifteen net recipient countries who regard handouts of huge sums of cash as their right. It isn't their right and it should come to as halt as soon as possible, deal or no deal. Theresa May and David Davis might remind the EU of about 900,000 British lives lost in WWI and about 550,000 in WWII, including I must say, my father's brother in Libya. These European wars were not of our making but we helped them as neighbours. What of our financial costs for just WWII? I've found a 1945 figure of £40 billion. If we inflate that by London house price inflation of about x100 we have £4 trillion today. Yet our EU partners to whom we have been gifting money for 44 years are still demanding more. Sir Bill Cash recently suggested that ministers should 'bear in mind' that we halved the Germans' post-war debt. They'd actually been killing us, remember? So where's our neighbours' neighbourliness now that they think that they can demand more money for nothing? An odd thing has happened in the last few days. Theresa May has begun serious Russia-bashing. The evil Russians are apparently meddling in elections, hacking, planting fake news, formenting crises and "threatening the international order on which we all depend." The Americans have been trying to prove that Russia influenced Donald Trump's election for nearly a year now with zero proof – but they're still trying. Similarly with the fake news that our Prime Minister is quoting – from where? I followed a BBC feature on this to its source and found – nothing! Allegations, possibilities, inferences, associations but no proof whatever. Why do we spend astronomical sums on GCHQ if they can't find clear proof of Russian meddling? Maybe it isn't there to find. It would suit a lot of people to find evidence of Russian interference. It's all nonsense and fake news of the sort that I recall clearly from Tony Blair's Iraq War allegations and Colin Powell's anthrax vial and mobile chemical laboratories presented to the United Nations. Not fake news – lies. So what's it all about? On the American side, a lot of people want grounds to get rid of Donald Trump for collusion with Russia and if they can't do that, smear him to prevent his re-election. Theresa seems to be backing the American anti-Trump mantra, but why? And why bring it across the Atlantic? There's even a Parliamentary Inquiry about Russia influencing the Brexit referendum. I suppose that this is a smear that might de-legitimize Brexit. More than that, however. they're getting their smears in early. The fact is that Russia has enormous natural resources, they need technical expertise like ours to exploit them and they want to trade with us. Why not? If we treat Russia as an enemy, that's what it'll be. It's much better as a friend. What we've managed to do by treating post-USSR Russia as an enemy is to force creation of the Shanghai Cooperation Organization (SCO) in which Russia trades with China, India and Asia. This group has a population of 3.1 billion or 41% of the world's population. That's where the market is. Its very dynamic, growing fast and it starts with Russia, just the other side of the EU. By the way, the Russians are Europeans whose Christian-based values contributed to the collapse of communism – also just an economic system. From the time of Elizabeth I through Victorian times until WWII the UK had world vision and an independent foreign policy. That has all been lost. Our politicians have lost confidence, to become obsessed with minutiae rather that the potentials of our country, science at home and the world as our market. There are others too, bankers and the likes of Richard Branson who want the UK to be captive to a system that enriches them beyond reason while unemployment grows, wages buy little, children go hungry and food banks multiply. I donate to a food bank in one of the richest areas of London and it's deeply disturbing. Living conditions that we had thought were gone forever from this country are re-occurring. The EU has failed us. That's the origin of the Brexit vote, not 'the politics of hate' as a local MP put it at the last election – and lost his seat. With drastic reform the EU might survive, but that's not our concern and it's not our responsibility to pay for it. We've paid too much already and far from receiving thanks, have heard only demands for more. The Sunday Times says that there's a secret agreement with Brussels to pay £40 billion when we leave the EU. Why, exactly? If we pay anything at all it should be only our legal liabilities and a fair share of the costs of programs that we want to participate in, such as Euratom and security. £10 billion should cover everything. If there's an extra £40 to spare it should be spent on industrial and scientific development and marketing to countries that appreciate the UK and the quality of its products. We have seen the character of the EU politicians. We have their measure. They are not our neighbours despite close proximity because they are not neighbourly. They are small-minded con-men who don't know what friendship is and who want us to pay for a package of goods without our knowing what is in the package. That tells us everything we need to know about them. A deal won't be worth the price whatever it is. Theresa May showed serious naïvety in her snap election. She's in danger of being conned again. Pay the EU nothing except what we legally owe them and let them do what they like about it. 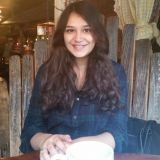 Ahana is an intern with The Bruges Group. An undergrad at Ithaca College, class of 2018, she is studying journalism and politics with a concentration in international relations. In the past, she's written for NVIDIA, PBS NewsHour, and Gannett Newspapers, covering subjects such as artificial intelligence, President Donald Trump's Inauguration, and local news.